There are not many office furniture pieces that can define a room like a high back office chair. Most often seen in conference rooms and executive offices, high back chairs send a message to anyone that comes to visit. They add an upscale look and the feeling of importance. There are a lot of different high back chair styles so it can be tough to decide which is best for your needs. We have taken our years of experience selling and using high back chairs to compile a list of what we feel to be the best high back chair options. We tried to provide a good mix of different style chairs, at different price points, so there would be an option for almost everyone’s needs. 9. What is a High Back Chair? 10. How Did We Pick Our Best High Back Chairs? 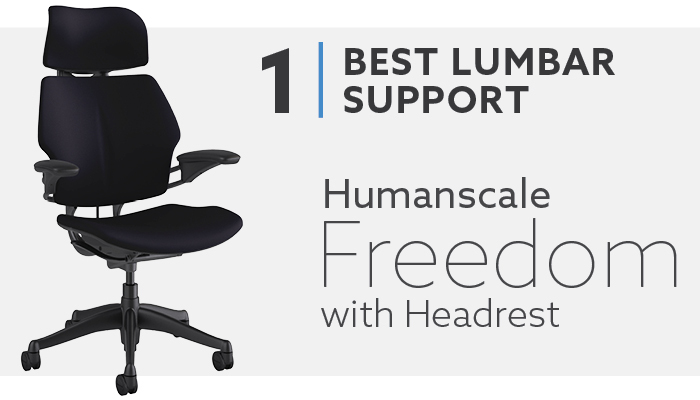 The Humanscale Freedom with Headrest is one of the most recognizable chairs on the market. No other chair has a design that looks like the Freedom. This is a high-end chair with a good build quality. The Freedom with headrest has a backrest that goes as tall as 32”, which is tied for the tallest back on this list. This is one of the best options that you will find for a chair with a backrest over 30” with good lumbar support. The lower section of the backrest has a pivoting function that tilts to the proper position to provide the best support. There is a pronounced lumbar curve and the back height adjustment ensures that you can get the curve in the right spot on your back. It features a weight sensitive recline function, so you don’t have to mess with tension controls or tilt locking positions. You can just lean back to the position you want to work in, and the chair will automatically hold you in place. This is one of the only chairs that keep your eyes at the proper level for typing all the way through the full recline range. This is also a great option for high design environments. The design of the chair is not only sleek and modern but there is a large selection of upholstery options, including top quality leathers. One of the biggest drawbacks to the Freedom is its high price tag. The chairs costs over $1,000 for the most basic fabric and the price jumps pretty quickly as you choose higher quality upholsteries. The arms may also be a problem for some people. For starters they are a bit wider than most chairs we have tested so they are not the best ergonomic option for smaller people. The arms also adjust in tandem. This will be a problem for those of you that like to have your arms at different heights for tasking. 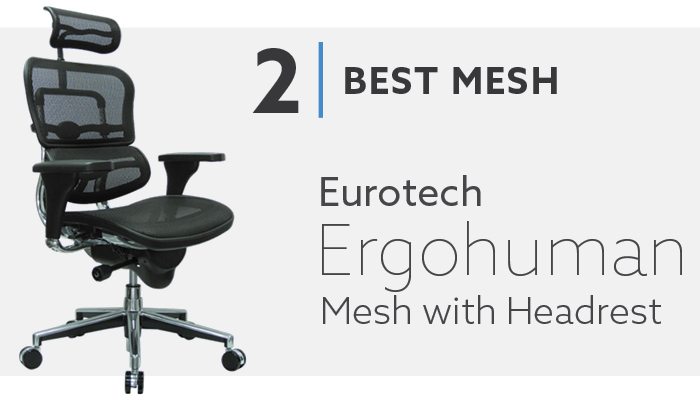 The Ergohuman Mesh with Headrest features a backrest that goes as high as 30.5”. The Ergohuman is an ergonomic mesh chair that could have also been a pick for best lumbar support. The backrest features a three section design, with separate sections for the lumbar, upper back and neck/head. The lumbar is very supportive and flexes based on the weight of the user. The backrest is height adjustable so you can get it in the perfect position for your height. It has tension adjustment and three lockable positions, which makes it easy to put the back at the angle you prefer. The headrest is also height adjustable and can pivot, making it easy to get it positioned in the curve of your neck for maximum comfort. 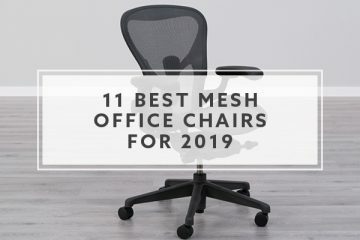 The Ergohuman has been a nice alternative to higher priced mesh chairs, like the Aeron, due to its numerous adjustments, good quality mesh and lower price point. The mesh is soft to the touch, has good flexibility and also holds its shape well. It is breathable, supportive and has six different mesh colors to choose from. The biggest potential downside with the Ergohuman is the seat. Some people may find it uncomfortable for a couple reasons. The first is that there is a metal frame around the entire seat. There are times that you may come into contact with the frame, which is not comfortable. The second issue with the seat is the mesh itself. Mesh seats are not comfortable for everyone so people that have been turned off by mesh seats in the past may want to look for an alternative product. I would recommend checking out the Ergohuman Leather or the Ergohuman Mesh/Leather combo, which features a mesh back with leather seat. 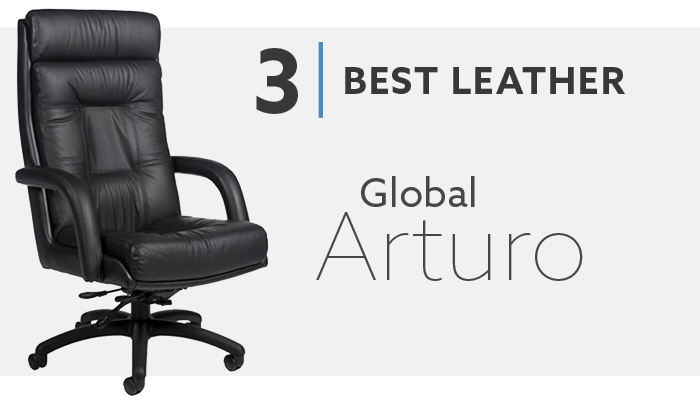 The Global Arturo is a solid option for a high back leather chair. It has a backrest that is 30.5” tall and features plush padded cushions and detailed stitching. The Arturo is upholstered in good quality top grain leather on all the surfaces you make contact with and mock leather on the other portions of the chair, which helps to keep the cost down. The Arturo is the type of chair that you envision when you think of a high back leather chair. The backrest has a thick pillow area to softly support your head. The soft seat cushion lets you sink in to be comfortable for long meetings. The Arturo features seat height adjustment and a center-tilt mechanism with infinite tilt lock and tension adjustment. It also has padded loop arms, a waterfall front seat edge and contoured cushions. The Arturo is not the type of chair that will have the adjustability of an ergonomic chair, but it has enough functionality to be a great conference room chair. One downside with the Arturo is that it is such a large chair. The seat is 21” wide, which is the same size as some big and tall chairs. The wide seat combined with the tall back may make petite people feel like they are swimming in the chair. The Arturo lacks the adjustability required for proper ergonomics. If you plan on sitting in your chair and tasking for multiple hours a day, then the Arturo probably isn’t the best option. 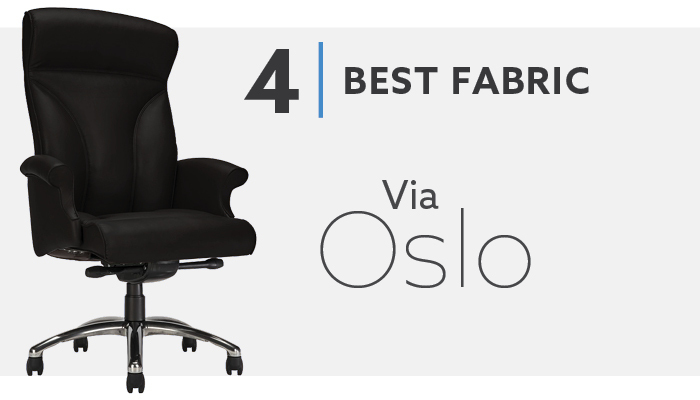 The Via Oslo is a high-end chair that features a backrest that is 31” tall. It was inspired from automotive engineering and is designed with a steel frame and injection molded foam. The Oslo really commands a room with its presence. It is also one of the most customizable chairs on our list. While the Oslo looks like your prototypical high back office chair, it has adjustments that make it much more functional than other similarly looking chairs. The chair comes standard with a knee-tilt mechanism and ratchet back height adjustment. Back height adjustment is rarely seen on chairs like the Oslo. The Oslo also has the option to add a seat slider, synchro tilt mechanism and eight different armrest options. There is no shortage of design options on the Oslo. While the chair is pictured in leather, there are hundreds of different fabric options, which is why it was chosen for the best fabric option on our list. There are fabrics of varying colors, patterns and durability levels. You can also design your chair with different fabrics on the seat and back for an even more unique look. There are two main downsides with the Oslo. The first is the high price tag. This is the highest priced chair on our list. It has a starting price of $1776.00 and can get as high as $3,500+. This is not affordable for a large percentage of buyers. The second issue is that this is another chair that may be too large and uncomfortable if you are petite. With a 31”H backrest and 21”W seat, this is a large chair. One way to make the Oslo a bit better is to go with the arms that feature 4-way arm cap adjustment. They will help to make the chair feel smaller than it actually is. The Global Obusforme is your workhorse ergonomic task chair and it happens to have a 32”H back. This is a nice option if you want a high backrest and as many adjustments as possible. The seat and back have good quality, thick foam. The Obusforme also comes loaded with functions. You have just about every adjustment you can think of on this chair. It has a center-tilt function with tension adjustment and tilt lock. It has pneumatic seat height adjustment and a seat slider. You can also adjust the angle of the seat forward or backwards. The backrest has independent back angle adjustment and height adjustment. The arms are width and height adjustable and the arm caps rotate. The Obusforme also has a nice back support system with elastomeric suspension and a piece of polycarbonate to form the lumbar curve. The back height adjustment allows you to get the curve in the correct spot to sit for long hours at a time. The Obusforme is a chair that will fit a wide range of people. It has a 300 lbs. weight rating. The seat height range of 16”-20” will be good for the vast majority of the population. It has a 21” wide seat and a tall backrest, which is good if you are bigger. But, the armrest adjustability and back height adjustment will allow this chair to be comfortable if you are smaller as well. 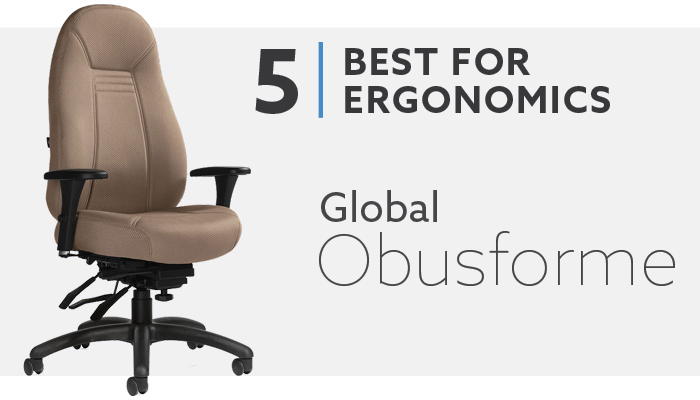 One potential issue with the Obusforme being our best for ergonomics pick is that you cannot adjust the lumbar independently. You cannot move the lumbar without moving the backrest. You also won’t be able to adjust the shape of the curve to be more or less supportive. The Ultimo 100 is a high back leather chair that makes a statement while also providing good comfort. It features top grain cowhide leather and a hand-polished cast aluminum frame. The aluminum features a powder coated gunmetal finish and you have your choice of black or burgundy leather. The Ultimo 100 has a 32”H backrest. The seat and back are large and sculpted to be deep and allow you to really sink into the chair. The seat and back are padded with molded foam, which provide good support compared to lower end cut foam. It has a cantilever arm design, which is a bit more functional than the standard loop arms we often see on leather high-back chairs. The armrests are padded and wrapped in leather, which helps to make the chair more comfortable for longer periods of sitting. The Ultimo 100 has a knee tilt mechanism with pneumatic seat height adjustment and tension adjustment. Knee tilt is an upgrade to the center-tilt mechanisms on a lot of high back chairs. A knee tilt mechanism puts the rocking point right behind your knees instead of the center of your body. This allows you to rock easier and it also doesn’t raise your knees up with you when you recline, like a center-tilt mechanism does. One of the biggest downsides with the Ultimo 100 is that the seat height range is 19”-22”. This is a similar range to big and tall chairs. This could be a problem if you are shorter. This is also not the best option if you are seeking an adjustable or ergonomic executive chair. This chair has very little adjustability so you will want to find another option if that is important to you. 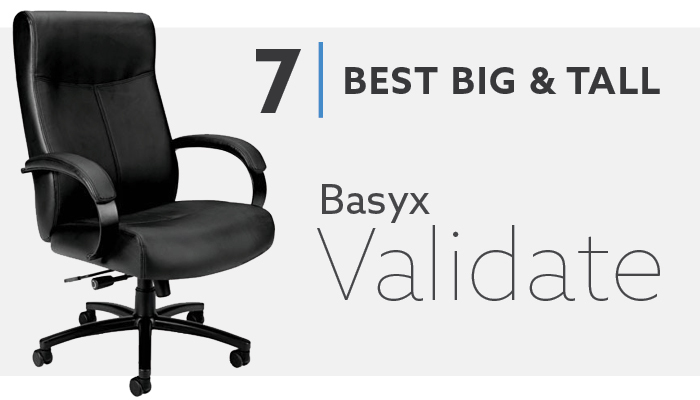 The Basyx Validate is your classic high back leather big and tall chair. The chair has a solid build throughout with reinforced components that allow for a 450 lbs. weight capacity. It features a 31 5/8”H backrest and a 22”W seat. The seat and back padding are thick, and the top of the backrest features an integrated headrest. The chair features SofThread leather with decorative stitching. The Validate has padded loop arms to help keep you comfortable. The Validate was not designed to be loaded with functions but it does have some adjustability to make the chair more comfortable. It comes with pneumatic seat height adjustment, center-tilt with tension control and an option to lock the chair in the full upright position. The Validate is a big chair. This may not be the best option for conference room applications because it won’t fit you if are small to medium sized. It will also take up a lot of space so you may not be able to fit as many chairs around your table. This is also not a good option if need an adjustable chair. This is one of the least adjustable chairs to be featured on this list. The Validate is also not a good option for people that want real leather. While the SofThread has good durability and feels soft, it is made with vinyl. 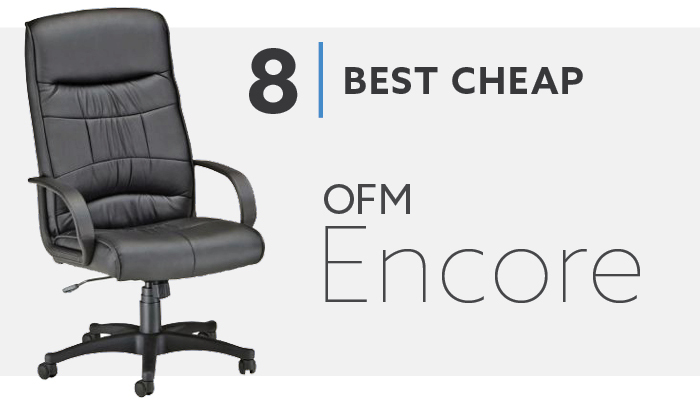 If you are looking for a budget high back leather chair, then the OFM Encore is a nice option. The chair costs less than $150 with free shipping. It comes with a backrest that is 30.5”H. The Encore is upholstered in OFM’s leatherette upholstery and features various stitches to help make the chair more attractive. The Encore features basic functionality with a center-tilt mechanism, tension control, tilt lock and pneumatic seat height adjustment. You also get loop arms. They are not padded but they do help to keep you more comfortable in the chair. The selection of high back chairs with price tags lower than $200 is a bit limited. The Encore isn’t as nice as the other chairs featured on this list, but it still provides good value for $149.99. This is another high back chair with a similar seat height range to big and tall chairs, 18.75″ – 22.50″, but is not designed as a big and tall chair. If you are shorter, you may not be able to have their feet flat on the floor. The leatherette used to upholster the chair really helps to keep the cost down, but it is not real leather. If real leather is one of your requirements, then this isn’t a good option for you. The final downside is the lack of adjustability with the chair. If you need some adjustability or plan to use this chair for long periods of tasking, then I would probably find an alternative product. What is a High Back Chair? In the office furniture industry, there is no set definition of a high back chair. Sometimes high back means that it is tall enough to support your head. Sometimes high back just means that it has a taller back than another version of the same chair. I have found that there are two main types of high back chairs. The first is a high back chair that will typically max out around 24” from the seat. It is designed to support your mid and upper back but there will not be any support for your head or neck. Some of these models will have a headrest option, which can extend their height to as tall as 32”. The second type of high back chair features a backrest that will be somewhere between 28”-32”. These chairs are designed to support your entire back, plus your neck and head. How Did We Pick Our Best High Back Chairs? The first requirement to make this list was that the chair’s backrest had to be at least 30” tall, when measured from the seat. This height ensures that all the chairs on this list will be tall enough to support your back and head. There were a couple factors that went into the final selection process for this list. The first was our experience selling high back chairs. We have been selling high back office chairs for over a decade, so we have a lot of information to go off of in terms of which chairs customers like and have been successful for them. The second factor was our personal experience using high back chairs. Having the opportunity to sit in so many chairs over the years has given us a wealth of knowledge. We know what to look for and which chairs are designed to perform better than others. The first thing that you need to consider is how high you want the backrest to be. As we have already discussed, not all high back chairs are the same. 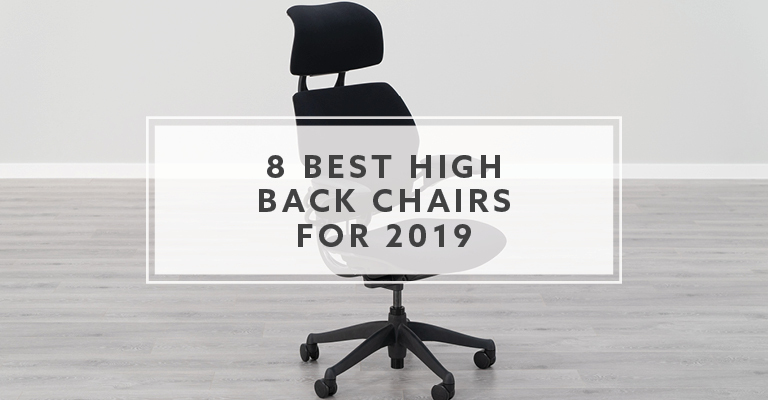 If you are looking for a high back option to support the entirety of your back, along with your neck and head, then this list will be helpful for you because each of these chairs meets that criteria. You may just need a taller back than the mid back conference or task chairs you are used to, but have no interest in a headrest. A high back chair that does not support your neck and head can still offer good comfort compared to mid back chairs. They will be more supportive for your upper back and shoulders and can often be used to convey a higher end look without having to go with a massive chair. If this is the type of chair you need, then I would look for models that have backrests around 24”-26” above the seat. The high back chair that you choose is going to be dependent on what you plan on doing with the chair. 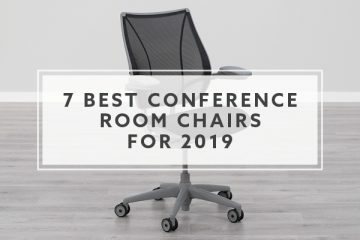 If you are looking for a conference chair, then you need to consider things like overall chair width so that you know how many chairs can fit around your table. You can also go with a chair that has fewer adjustments and focus more on the aesthetics of the chair. Typically, conference room chairs are only used for short periods at a time, so a lot of adjustability isn’t usually necessary. If you are looking for an ergonomic high back chair, then you will need to make sure it has all of the adjustments you require. Some people are okay with their ergonomic chair having only the necessary adjustments while others want as many as possible. 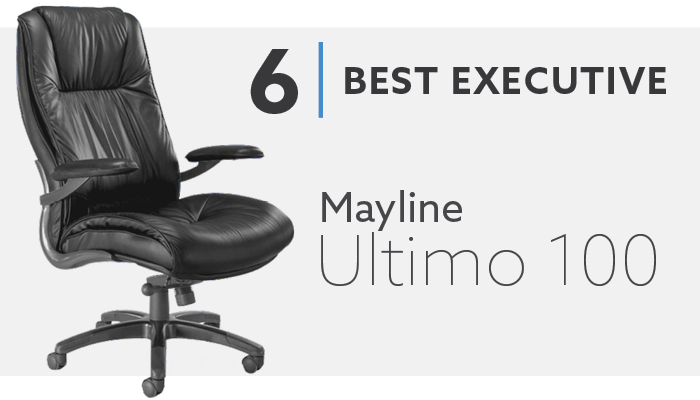 If this is going to be your next executive chair, then you are going to want to focus on the look of the chair so that it fits with and executive office environment. But you also want to be comfortable when you need to use the chair for extended periods at a time. Things like padded armrests, nice foam and an upgraded mechanism can improve comfort pretty quickly. High back chairs are designed with different kinds of headrests. Often times the headrest will be designed to go in the curve of your neck, like the Freedom or Ergohuman chairs. These are typically found on ergonomic chairs that feature more adjustability. These chairs typically excel at tasking applications. It is usually important for a headrest like this to have height adjustment so that you can get it in the correct spot on your neck. Some high back chairs have soft pillow-like pads for your head to rest on. These will most often be found on executive high back chairs because they are more suited for sitting back in the chair. You can keep your head comfortable for longer periods of time while meeting with clients or employees. The final kind of high back chairs will not have a specific headrest at all. The back will remain the same thickness, without a pronounced area to rest your head. These are most often seen on conference chairs and traditional chairs. These types of chairs are often going for a specific look with less concern on the overall comfort of the chair. There are four main types of upholstery: fabric, leather, mesh and fake leather. I have found that the upholstery with the fewest high back options is mesh. Almost all mesh high back chairs go up to around 24”H above the seat. This is enough to support your mid to upper back, but your shoulders, neck and head won’t be supported unless the chair has a headrest option. Almost all of the mesh high back options I have found to be over 30” are because of a headrest addition. If you need a mesh chair taller than 30” then you may need to go with a headrest version. There is a decent amount of options available for fabric high back chairs. The biggest problem with fabric is that the lead time is often extended for custom colors or patterns. You have many more options compared to mesh or leather but that often comes at the price of having longer lead times. If you have a deadline then it may be necessary to go with a stock fabric or leather. Leather and fake leather are the most commonly found on the high back chair. This makes sense because most high back office chairs are going into meeting rooms, board rooms and executive offices. These locations typically command a higher level of quality than a tasking area. While leather is typically looked at as the highest quality upholstery, not all leather is treated equally. Higher grade leathers will look nicer and hold up longer than lower grade leathers. Fake leather is a nice option because it gives you the upscale look of leather, but you pay a lower price and it is often easier to clean than real leather. It won’t wear as well over time and you don’t get that genuine leather smell but sometimes it is just about the look of the chair. If fake leather can save you some money, while still giving you the look you desire, then it can be a good alternative to the real thing. There are a lot of different high back chair options currently available. Knowing how to start your search will help to make the decision making process much easier. Being able to identify what your specific needs are is crucial so that you can start to narrow your search and hone in one what the exact type of high back chair is that you want. This list contains a range of high back chairs that can serve many different applications with different styles and prices but there still may not be an option that fits your needs. That is ok. This list can still be helpful for you to see what is available and how to go about your search. 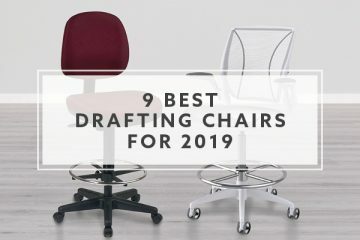 At the end of the day, we want you to find the best high back chair for your situation and we hope this list helps you do just that.